* a work usually consisting of multiple distinct sections or movements, often four. Fennesz uses guitar and computer to create shimmering, swirling electronic sound of enormous range and complex musicality. “Imagine the electric guitar severed from cliché and all of its physical limitations, shaping a bold new musical language.” – (City Newspaper, USA). His lush and luminant compositions are anything but sterile computer experiments. They resemble sensitive, telescopic recordings of rainforest insect life or natural atmospheric occurrences, an inherent naturalism permeating each piece. He lives and works in Vienna. 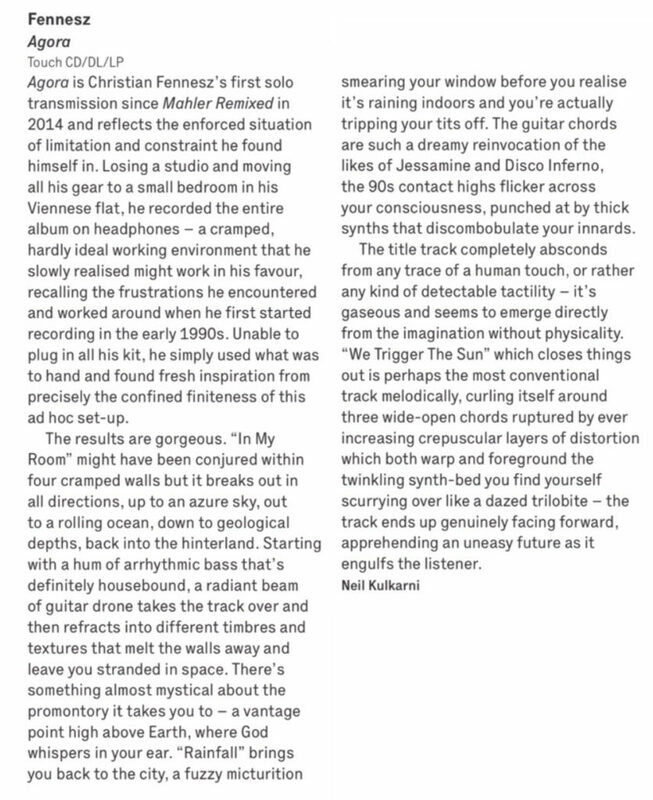 Austrian experimental guitarist Christian Fennesz returns with a new album Agora. Four long tracks recorded in “straightened circumstances” after Fennesz lost access to proper studio space and was forced to record in his bedroom on headphones with limited equipment. Guitar, voice, field recordings and a computer. These tracks sound like living things, breathing and swelling like an enormous dreaming cat. They tap into the alpha waves and circadian rhythms of life. Gorgeous, meditative drones build and deepen. Surface ambiance atop propulsive rhythm, all bottom end, giving time and space to for listeners to immerse themselves in an amniotic warmth. Human elements of voice, of fingers squeaking over strings and fret board emerge from the depths. Computers are tools used here to express intelligence and emotion. Like all artists Fennesz shows rather than tells. Everything is there to feel if one allows the music to envelope. “In My Room” builds slowly with restrained squalls over a deep heartbeat. Over 12 minutes, Fennesz layers treated guitar atop throbbing sub bass. As usual he takes his time and is not afraid of long, heavy notes. Yet this is never claustrophobic even as the walls seem to close in. The sense of space is palpable although there are no cracks through which to reach the outside world. Everything vital is in the room, protective, embracing. “Rainfall” is likewise heavy, multi layered and detailed. Techno propulsion and rumbling bass tones, wordless vocals by Katharina Caecilia Fennesz, the guitarist’s touch across the strings. A subtle wave of static and ecstatic washes of sound with moments of quiet to contemplate the oncoming tempest that hits hard, urgent but not dread(ful). “Agora” with field recordings courtesy of Manfred Neuwirth and vocals by Mira Waldman is a much straighter ambient piece. The energy levels drop here but there is space for quiet reflection after the storms of the album’s first half. “We Trigger The Sun” opens like a chamber orchestra in Atlantis with submarine beeps, heavily treated strums, more sub bass. Underpinning this is an almost sacred melody that is subsumed by the weight and power of a glitch laden bass drum and crushing layers of guitars and synth crescendo. Even if you’ve never heard the name of Austrian electronic-music pioneer Christian Fennesz, you’ve likely heard the effect of the work he’s been releasing for two decades under his striking surname. An early advocate for using a laptop to splice, sample and otherwise subvert the sound of his guitar and field recordings — in the process forming crackling electric symphonies — Fennesz has long explored the shapes and colors taken on by clouds of static. On 2008’s Black Sea, shards of noise culminated in a crescendo as sun-streaked as the most radiant orchestral fanfare; on his early landmark, 2001’s Endless Summer, ravaged guitar chords funneled the chimes of a miniature gamelan ensemble into a chorus that felt like a surrealist hit. Despite its core of accessible allure, though, Fennesz’s music remains somewhat esoteric, stuck between stations of electronic bombast and pop approachability. But his animating ideas — of sounds beautifully dissolving into the ether, like soft metals dropped into a vat of strong acid, only to resurface against all odds — have trickled toward the mainstream as if through a years-long game of telephone. That’s a trace of Fennesz you hear in the delicate architecture of Bon Iver’s 22, A Million, in the work of other Kanye West collaborators and acolytes, and even on Ariana Grande’s thank u, next. The work of experimental artists drifting toward the charts is not a phenomenon limited to Fennesz, of course. But his case remains peculiar because he’s the inarguable master of this strategy — that is, of damaging a signal not only until it’s destroyed, but until it sparkles anew. On Agora, Fennesz’s first album in four years — and perhaps his best and most resonant since Endless Summer — he again finds harmony in hellish tones and exudes warmth by rubbing together cold sounds like kindling in a frigid clime. At a glance, Agora may seem slight, with only four tracks that each break the 10-minute mark. If not necessarily longer, his prior records sport at least twice the cuts, meaning there’s more sense of motion and transition during a similar span. But Agora is uncommonly generous, as each extended piece establishes and steadily works through its own sophisticated mood. Listening suggests shuffling from screen to screen in some aging arthouse, with a different compelling short film playing in every room. Each feeling is deep, each scene rich; by Agora’s end, when the jeweled synthesizers of “We Trigger the Sun” finally vanish at the horizon, it seems as if listeners have accompanied Fennesz on a particularly emotional odyssey. These pieces are as open to interpretation as the underlying instruments that shape them. There’s the constantly cycling rhythm of “In My Room,” which spins with the weight of a canyon-sized washing machine. Thin, threatening fins of irradiated synths slice through the beat, countered by organ chords as gentle as deep breaths. A flash flood of sculpted noise eventually washes over everything, but its tone is somehow comforting, as if offering assurances of rebirth even as it obliterates. These 12 minutes feel like taking the time to watch a beautiful sunrise during a family emergency — or, just as easily, dreading the end of some blissful moment while it’s still happening. And, with its slowly unfurling drone and wind-like whispers of distortion, does the title track score a haunted nightmare or a perfect dream? After briefly losing his studio, Fennesz recorded Agora in a bedroom in his apartment, jettisoning all the lavish equipment at his disposal for a simple setup of headphones and computer. You can trace that interior quality here; the sense that Fennesz is working through feelings and ideas in a fevered, extended monologue. “We Trigger the Sun” frames a real-time document of that process, with gently arcing guitar chords and intensely curdled electronics that push and pull against one another above the languid heartbeat of a tom-tom. Every time the track inches toward resolution, Fennesz plunges again into another strata of doubt, the sounds locked in perpetual conflict. It’s a very 2019 sort of unease — timely in its deliberation between wrong and right, fact and fiction, comfort and despair. Christian Fennesz is a hero to fans of minimal electronic music. Since 1997 he has crafted and created soundscapes that feel euphoric and melancholy at the same time. And it’s hard to know where to start in order to explain him. The same is true of this new album Agora. At times it is ethereally forlorn and at others defiantly joyful delivering some of the most uplifting pieces of music this year. But to understand the album, you have to understand how it was created. Shortly before Agora was recorded, Fennesz lost his studio and had to move all his equipment back to a small bedroom in his flat. This meant recording on headphones, rather than letting the music roll and cascade around him. At first he found it frustrating, but as the sessions continued he started to get reminded how he used to record in the Nineties. ‘I used very minimal equipment; I didn’t even have the courage to plug in all the gear and instruments which were at my disposal,’ Fennesz said. ‘I just used what was to hand.’ This recording process works incredibly well as Agora feels like a distant cousin to his early recordings, but still exudes the skills and balance of his later work. Fennesz is a master at his trade and like Gian Lorenzo Bernini who chipped, sanded and delicately removed layers of marble to create something awe inspiring and ultimately captivating, Fennesz does the same with dense swaths of static and feedback. He uses lighter tones to cut through this fug of noise, thus creating elegant melodies and hypnotic motifs. There is something beguiling about these compositions. At first they feel like they are made of obsidian and impenetrable. No matter how you look at them, they offer no way in to their complex maze of sounds and tones, but after a few listens they start to show entry points and sound warming. ‘In My Room’ is a prime example. From the opening tones it feels like its exploration is pointless, but after a few listens you find a hole and enter its murky maze, which reveal one of the most life-affirming moments of 2019 so far. Agora really comes alive with the title track though. It is 12 minutes of swirling synths and droney guitars. On the surface it feels like there isn’t much going in, but just below the deep drone there is a lot happening. Tones are tweaked, pitch is lowered, bass is momentary added to create something that is moving and feels alive, rather than just a collection of musical instruments that were close to hand. Songs like this demonstrate why he has been at the fore of minimal electronic music for the past 20 years. The experimental musician’s sweeping, ambient album works in small, fascinating ways from moment to moment but has a cumulative force that is unlike anything he’s done in years. Christian Fennesz puts you on a guitar-shaped raft and sends you out to sea, his ambient waves cresting with distortion and hypnotic melodies. It’s hard to grasp that his 7th studio album, Agora, was made by Fennesz in a bedroom at his flat after losing studio access, as this is the kind of album that doesn’t feel like it was recorded in a bedroom, or even a proper studio. It recalls waking up before your alarm and being transplanted into a lucid dream, conscious and unconscious all at once. Typically seen in conjunction with a -phobia (or similar) suffix, “agora” originally referred to not the outdoors but to a multi-purpose forum in ancient Greece. Fennesz’s album consists of four tracks, the shortest clocking in at ten minutes. Their titles feel far less incidental than on most ambient/drone releases. They seem to form a narrative of an individual finding themselves emerging from their isolation to a point of no return. We begin with ‘In My Room,’ with waves of guitar quickly crashing receding in time with blasts of bass. As the strums of guitar echoes for miles and the hiss mixes with tranquility, it’s like entering a new world but realizing you’ve been there all along. While Anthony Gonzalez might have (partial) ownership of the sky, Fennesz ends Agora by declaring ‘We Trigger the Sun.’ The track lengths are never a liability, as he always finds something for his sounds to do, like when he introduces a crackling drone and heightens the tension with percussion and potent layers of guitar. It all pays off emotionally, as a deep yearning is felt in the buried melody and it grows deeper as it moves out of the darkness into an ascension. The album’s strengths aren’t limited to its bookends. ‘Rainfall’ would go down as the instrumental track of the year if not for the vocal contributions of Katharina Caecilia Fennesz, which blend so gracefully in the mix that you might not even realize they’re a human instrument. It also highlights Fennesz strength as an experimental guitar composer in that he never tries to smooth out his instrument of choice to the point that he hides what it is. His tones clatter and wear their fuzz proudly. At one point on ‘Rainfall,’ his tones are fuzzy to the point that they sound like he’s sucking distortion through a straw. The title track is the most ambient and, by default, the one with the least activity. But his ability to refine his textures is masterful, with each moment being one you could stay with forever, but when it does shift, it’s a shift worth taking, with field recordings from Manfred Neuwirth and vocals from Mira Waldmann granting further refinement. It also helps to prepare for the closing behemoth that is the closer. Reviewing ambient music leaves a lot up to the interpretation of the writer, particularly when the background is as minimal as it is with this album. The extent of what’s been shared is that Fennesz made it in a bedroom with little gear using headphones. But sometimes a limited amount of information is all we need, particularly when it lets us focus all the more on the absolute allure of the final product. It has been roughly five years since Christian Fennesz last surfaced with a proper solo album (2014’s excellent Bécs), though he has certainly kept busy with other projects in the meantime. For this latest release, however, he found himself in unusual straits, as he lost his studio space and had to move all of his gear into his bedroom. In theory, that was not an optimal work environment and he never ended up setting up much of his usual arsenal, but new constraints can often lead to unexpected breakthroughs. That is arguably the case here: while Agora is not quite an Endless Summer-caliber bombshell or a groundbreaking reinvention of Fennesz’s aesthetic, it is definitely a modest masterpiece of sorts, as quietly recording in his room with minimal gear and omnipresent headphones paved the way for a quartet of truly lovely, nuanced, and absorbing soundscapes. I wish there was a way to say this that does not sound like an ambiguously back-handed compliment, but it feels like Fennesz devoted an unusual amount of time and focused attention to this album. On previous masterpieces like Endless Summer and Venice, he had a strong, coherent vision and shaped variations upon each theme into an immersive and thoughtfully sequenced arc. Needless to say, that approach worked extremely well, so there was no real need to change it anytime soon, yet Agora takes quite a different shape than its illustrious predecessors. In fact, it almost feels like four self-contained mini-EPs: they certainly all feel like they belong together and complement one another beautifully, but each seems like it could have easily been the kernel of its own distinct album instead. While I suspect at least three of those hypothetical albums would have been absolutely wonderful, I do not have any nagging sense of missed opportunity with Agora, as each of these pieces (all clocking in just over ten minutes) feels like a perfect distillation rather than a tantalizing glimpse that begs to be expanded upon. In particular, the album’s two bookends stand as particularly striking examples of Agora’s divergent stylistic threads. Of those two poles, it is the aptly titled opener (“In My Room”) that best represents the beating heart at the core of the larger song suite. There is almost an actual beating heart in the piece as well, as a subterranean throb slowly pulses beneath its warmly hissing and undulating reverie of dense, buzzing drones. While those slow-moving sustained tones are certainly the raw material, it would be a stretch to call “In My Room” a drone piece, as it feels more like a landscape of gently shifting tectonic plates bathed in the light of an ascending sunrise: subtly amassing streaks of warmth and color quietly start to eclipse the underlying drones as the piece inexorably moves towards a gorgeous crescendo. The two pieces that follow stick to roughly the same aesthetic of quietly lovely ambient drone that ultimately blossoms into something more structured and powerful, though “Agora” does not pull off that feat quite as well as its neighbors (primarily because it starts from a colder, more formless place). The title piece is still quite likable in its own right though, as its floating, slow-moving clouds of blurred and hiss-soaked chords are blissfully meditative–it just has the misfortune of being surrounded by three slow-burning epics of focused intensity. In “Rainfall,” for example, Fennesz revisits the languorous drones of “In My Room” with unexpectedly vivid and visceral heft, launching an oft-brilliant and churning assault of shuddering, sizzling chords and cascading, overlapping motifs. It is essentially classic Fennesz writ large and it is absolutely wonderful. The closing “We Trigger the Sun,” on the other hand, is almost entirely unrecognizable as a Fennesz piece at first, resembling the sort of deep space ’70s synth music that would be perfectly at home in a cinematic mindfuck like Mandy. Gradually, however, the heavy cosmic vibes dissolve a bit to make room for more traditional Fennesz-esque touches like washes of hazy guitar chords. It is quite a wonderful convergence of unlikely threads, resembling something like a blurred, stretched, and deconstructed Popul Vuh without sacrificing any of the grandeur. The agora has historically been an important physical, cultural, political and symbolic space. In ancient Greece it was a place of community assembly, a place where military, political and commercial activities would take place, alongside other events, whether recreational, religious, or otherwise. The agora is also necessarily an outdoor space, but on his new album of that title Christian Fennesz seems to suggest that this particular soundscape is neither inside nor outside (and it is perhaps interesting to note that the album was recorded on headphones in a bedroom at a time when Fennesz had lost access to what he called “proper studio workspace”). Rather, it occupies an imaginary area that refuses any spatial constraints, while acknowledging and insisting upon an acknowledgment of our own relationship to variations of temporality. Fennesz’ Agora is neither urban nor pastoral/bucolic. It is of a world, but not necessarily this one, and as such it suggests a challenge to the boundaries of what we might normally think of as the “public sphere”. Furthermore then, the agora conjured by Fennesz in this context is by no means necessarily a communal space, and may indeed depict an entirely fractured and atomized social structure. In all of these respects, this work posits a reconsideration of what it means to interact with the world at this state of human history, far removed from ancient and established social and political structures, and yet at a time when we are all more deeply interconnected in many obvious and also insidious ways than we have ever been. It is also, perhaps more importantly for the purposes of the task before us, a really good album. The mind games, if such they are, begin with the mischievously and counter-intuitively titled opening track, “In My Room”. We start, then, with an immediate retreat from the public forum, counter to what the album’s title might lead you to expect. The track opens with a rough pulse which gives way to an extended mid-range drone, as if we are travelling down a pipeline beneath the market square, away from any society, toward an unknown but almost surely metaphysical destination. Other drones join the originating one, and then chords are very discreetly introduced as the song enacts very subtle changes at its own moderate pace. Once the opening pulse drops out there is no percussive rhythm to speak of, so we find ourselves in a realm without a hard beat, but nevertheless constantly aware of time passing, regardless of what kind of physical space we might be occupying, or Fennesz might be asking us to imagine. All of this unfolds over 12 rather luxurious minutes, as if one were in a significantly more pleasant version of an MRI chamber, lulled by inorganic aural materials and other sensory prompts into a place that is decidedly neither inside nor outside, although it nevertheless seems to have a certain structure, albeit one that is open-ended and unfussy. There is certainly no clutter here, so Fennesz appears, rather effortlessly, to have tidied his room according to the strictures of a state-of-the-art brand of personal feng shui. The connection between agora and feng shui may not be inappropriately deployed here, because the notion of a public space tied both to conceptions of how we orient and organize our public spaces spiritually, and more colloquially how we organize our personal and private spaces for our own contentment and to harness certain energies, seems in its totality to resonate with the way the Fennesz conjures the symbolic space of his own aural imagination here. The balance of this album is immaculate, with each of the four songs lasting between ten and 12 minutes. The internalized soundscape of “In My Room” gives way in turn to a more outward-facing perspective with the second track, “Rainfall”. Also almost 12 minutes in length, it is equally meditative, but takes a different reflective path from “In My Room”. Opening with a faint and delicate note, almost as of a subway train approaching from a long stretch of tunnel, the song resolves into something approaching conventionality with a very discreet rhythm track and chords that seem to blend something of the outro of Roxy Music’s “More Than This” with the burning and crackling of Sonic Youth’s “Providence” from the epic and elemental Daydream Nation. There is, by definition, something deeply elemental about “Rainfall” too, as evidenced by the more organic instrumentation at work. We even get something the resembles a gently strummed acoustic guitar chord here and there, albeit that it tends toward distortion, inevitably, and any sense of the bucolic gives way to something more post-industrial. The title track, which is also the penultimate song on the album, compels us to consider what we might mean, at this point in the history of civilization, when we imagine a fully functioning and fully evolved public space, and what it might look and feel like, all while we feel as if we are simultaneously in retreat from it. The track opens in a way that seems to combine the modes of the two tracks that have preceded it, both with a rough pulse and a series of developing and resolving chords, as if these sounds are themselves the aural representation of an organic human and political culture, with entities interacting, coming together, separating and then coming together again, acting jointly and separately, individually and collectively, to form a constantly oscillating and evolving body politic. 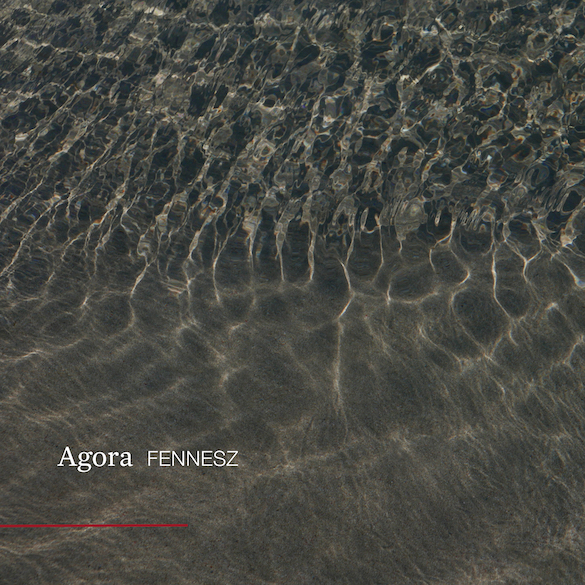 The richer and more insistently sustained (and varied) chords of “Agora” seem to represent the apotheosis of the Fennesz vision for this particular sound space. It also feels, perhaps paradoxically, like the darkest of the four tracks on display here, all while it seems, on occasion, to be reaching toward the light, as morose chords open up into breezier ones, and we oscillate along with them, between poles of more and less hope, or more and less despair, depending on the fullness or emptiness of your particular spiritual glass. On balance, the impetus of this title track seems ultimately then to tend more toward light than the darkness that appeared to be its signature, which may offer a clue as to the temperamental inclination of the album as a whole, although it is difficult to make any concrete conclusions as to the album’s disposition in such an abstract setting, particularly when it also seems to offer itself up as something rather like a mirror, if not a palimpsest, for us to see ourselves in, or inscribe ourselves upon. As we appear to have been led toward the light on “Agora”, the full flowering of that trajectory appears to come to pass on the final track, “We Trigger the Sun”, which seems to be the closest we get to a version of the pastoral here. This song offers perhaps the richest and most expansive sound palette of the four presented to us. There is even a gesture toward melody in these closing moments even while a meditational drone continues to be the backdrop. And those might even be some kind of strings in there somewhere. “We Trigger the Sun” feels positively romantic in places, which we might not be able to say about what has preceded it, for better or for worse. But aside from all this abstract thinking, it should be said that Agora is beautifully measured and evenly balanced, and as a result it is a very satisfying listening experience that appears to be almost hermetically sealed, as befitting an album that was made, as Fennesz himself said, “on headphones”. Part of that hermeticism, while also running counter to the idea of a practising and functioning community, also seems to resist any intertextuality or comparison with other artists, but it seems inevitable and necessary that one consider this piece of work alongside another recent release with a similar structure, that being the quite remarkable experience of After its own death/Walking in a spiral towards the house by one of Liz Harris’ many creative personae, Nivhek. “Agora” ist das erste Soloalbum von Christian Fennesz seit fünf Jahren (“Bécs”, 2014), doch war der Musiker seitdem keineswegs untätig. Er spielte mit Jim O’Rourke “It’s Hard For Me To Say I’m Sorry” (2016) ein und beteiligte sich 2017 am von Ryuichi Sakamoto kuratierten Glenn Gould Gathering, das in Zusammenarbeit mit der kanadischen Botschaft in Tokio anlässlich des 85. Geburtstag des Pianisten stattfand (und an dem auch Alva Noto und Francesco Tristano mitwirkten). Das neue Album ist quasi aus einer Verlegenheit heraus entstanden. Wie Fennesz selbst schrieb, musste er seine Ausrüstung aus dem Arbeitsstudio ins Schlafzimmer transferieren, wo er “Agora” einspielte. Die Aufnahmebedingungen waren vielleicht nicht optimal, da alles mittels Kopfhörern zu geschehen hatte. Überdies nutzte der Österreicher – aus der Not eine Tugend machend – nicht einmal alle Instrumente, die ihm zur Verfügung standen, sondern er bediente sich dessen, was gerade zur Hand war. Das Ergebnis sind vier intensive Stücke von je zehn bis zwölf Minuten Spielzeit. Mit der Konzentration auf Weniges wird Zeit entschleunigt. Fennesz zeichnet mit seinen langsam vorüberziehenden Gitarrenwolken intime Klangfarben, die zu einer Art Yogaminimalismus einladen. In diesem Ambiente bewegen sich die Melodien wie Seelenreisende zaghaft durchs labyrinthische Dickicht und preisen sich nicht so offen an wie etwa auf dem Vorgänger. Alles wirkt verhalten, erkundend, fast neugierig tastend und wie ein Innehalten, das gleichzeitig fließt und immer wieder Assoziationen zum Wasser hervorruft, das sehnsuchtsvoll auf der Stelle wirbelt; ein Paradox aus Bewegung und Stillstand, das sich beim Regen (“Rainfall”) ebenso gut einstellt wie auch beim Wolkendurchbruch der Sonnenstrahlen (“We Trigger The Sun”). Ein Schlafzimmer ist, wie eine Agora, manchmal ein Multikommunikationsort, an dem sich unterschiedliche Stimmen im freien Spiel entfalten und symphonisch der Muße und Muse frönen.